I had such a great time hanging out with old blogging friends and meeting new ones in the first round of the Blogger CLUE Society, that I could hardly wait for the next assignment! This month, we were asked to make a recipe from our partner's blog that our grandmother would've made. I was thrilled to draw Christiane's fabulous blog, Taking on Magazines. I've known Christiane ever since I started blogging years ago and it's been so much fun getting to know her family (especially Dudette!) and her cooking. In perusing her blog to find the recipe I'd recreate, I came across so many of her old posts that I loved when I read them the first time around. If you enjoy hilarious stories served alongside some delicious recipes from your favorite magazines, you really need to be following Christiane's blog. And speaking of delicious recipes, I had the hardest time choosing one my grandmother would make especially because my grandma was a feisty, beautiful, and very strong-willed lady. I kept thinking the recipe had to be just perfect because she was a pretty perfect lady. One of the things I loved about my grandma was that she was an adventurous foodie! When all the other kids were eating standard Pakistani fare, my grandma introduced me to things like sandwiches slathered with mayo (gosh, she loved her mayo), decadent cakes layered with rich frosting (for she was a lady that did not believe in diets), and the most amazing range of soups. From chicken noodle to gazpacho, my grandma was a firm believer that a nice meal always started out with a bowl of soup. And so when I happened on Christiane's recipe for Sweet Potato, Corn, and Kale Chowder, I knew my grandmother would approve! As soon as I saw the recipe, I wanted to have the soup in my belly as soon as possible so I had to work with the ingredients I had. I wanted to at least have a potato, corn, and green element and so, the Smoky Potato, Corn, and Poblano Chowder was born! This soup is perfect for a first course or a hearty meal and comes together really quickly, especially if you have some of the ingredients prepared ahead of time. During the summer months when fresh corn on the cob is plentiful, I always buy extra, grill 'em up, cut off the kernels, and freeze them for later. 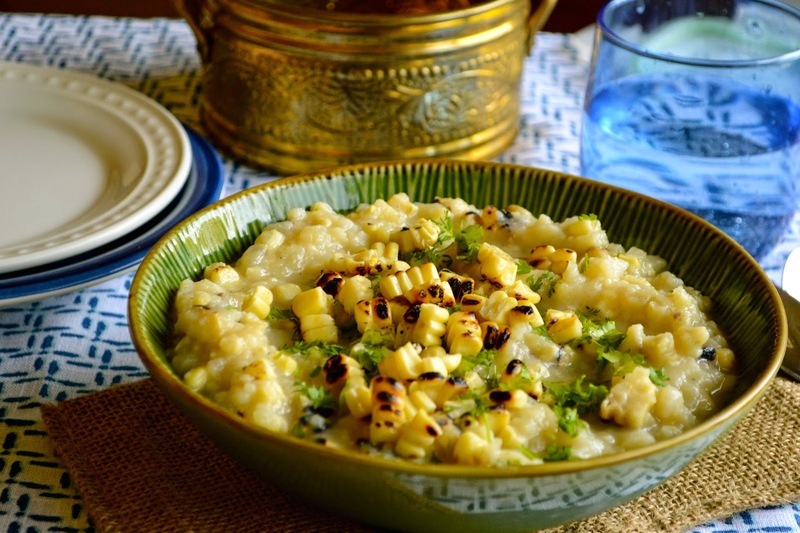 If you don't have grilled corn kernels ready to go, you can use frozen corn kernels, thawed, and grilled on a pan. I'm also a huge fan of poblano peppers and always have them on hand and if you've never come across one, you need to pay a visit to your local Mexican grocery store, like now! And while this chowder is fantastic especially in the winter months, you better believe I've added some sweet potatoes, corn, and kale to my next grocery list for my next chowder. Boil potatoes until fork tender and drain. In the same pot, melt butter and saute onions until translucent. Add garlic and saute for 1-2 minutes. Add potatoes and stock and bring to a boil. Grill corn on the cob over direct flame until corn is charred in spots. Slice kernels off the cobs using a sharp knife. 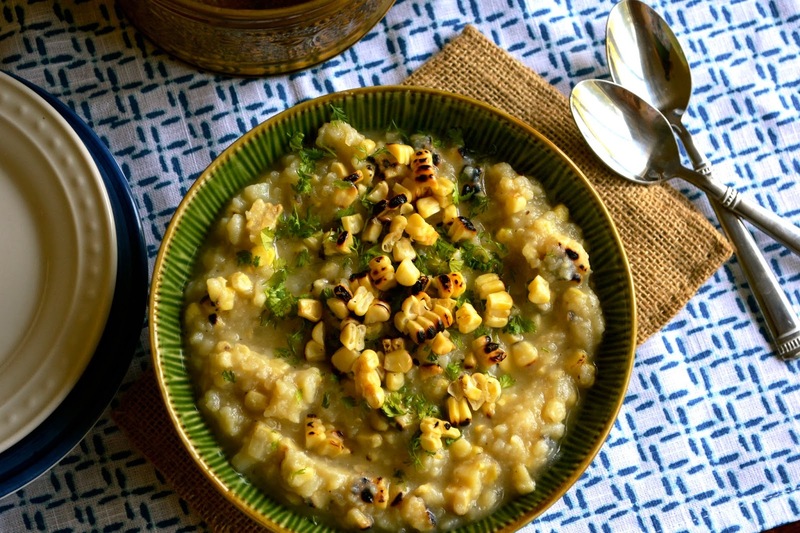 If you are using frozen corn kernels, thaw, drain completely, and in a separate pan, toast corn until charred in spots. Add the corn to the soup pot and lower the heat to simmer. Grill poblano pepper over direct flame until charred in spots. Place charred pepper in a glass bowl and cover with plastic wrap for about 10 minutes. Then, peel the skin off the pepper, dice the pepper, and add it to the soup pot. Add the milk one cup at a time to the soup pot. Once all the milk is added, use a potato masher to mash the potatoes until the soup has the desired consistency. Season with salt and pepper. Oh, yeah! I want this gorgeous soup in my belly, too!!! Wow... another dish I want to enjoy right now for breakfast. Since it's incredibly cold out... this soup will perfectly warm my belly! Great choice for the challenge! A big bowl of warm soup sounds so good! We loved your beef barley soup for my post. Thank you so much!! This soup sounds fantastic. Love the char marks on that corn, makes me want to dig in. I love soups in the winter and I have all the ingredients for this right now - I'll be making this one soon! Ahhhh, another soup idea for this Winter. This one looks so good! I love the smoky aspect. I want that in my belly, too!!!!! You had a great assignment. I am a huge soup fan, all year long, but especially in the colder months. You've got a great rich bowl of comfort right there, Azmina! Delicious flavors! i like the idea of grilling and freezing corns...also poblano are delicious..i could see myself downing this chowder in no time. Azmina - this is the PERFECT recipe to make for tomorrow's BIG storm. I hope you have leftovers. :-) Great post. Hope you and your family have a wonderful holiday season! Your grandmother sounds like a phenomenal lady! And this sounds like a phenomenal soup - love how thick and hearty it is - that cashew butter in it was such a neat idea! Loved reading about your grandma. Sounds like she was a very special and fun lady! And this soup is easy to love...hot, sweet, creamy, hearty! Yum! I've got frozen corn all the time but I better remember to grill fresh corn and freeze some like you! I am craving a big bowl of soup so this chowder looks like it'd hit all the magical spots! What a fun club ;) I love how thick and awesome this chowder is!!! I just wanna dig in! Aaw your grandmother sounded like an amazing and special lady! Love how thick and hearty this chowder is! It looks so comforting and full of flavor and would definitely warm me up during these cold nights! I love Christianne's blog and her amazing dedication to cooking fabulously. This looks delicious A! I'm wishing I had thrown some corn in the freezer for a big bowl of this. I'm liking this CLUE thing, hopefully after the holidays are over I can get back on some sort of blogging schedule. Looking forward to Jan. Hope you and your sweet family have a Merry Christmas. Hope the poblano peppers are not very pungent.